More information about how Data Acquisition works in this link. The OMEGA™ iTHX transmitter lets you monitor and record temperature, relative humidity, and dew point over an Ethernet network or the Internet with no special software except a web browser. The iTHX serves active web pages to display real-time readings, charts of temperature and humidity, or log data in standard data formats for use in a spreadsheet or data acquisition program such as Excel or Visual Basic. Chart scales are fully adjustable on the fly. For example, the chart can display one minute, one hour, one day, one week, one month or one year. Temperature and humidity can be charted across the full span [-40 to 124°C], and 0 to 100% RH or within any narrow range such as 20 to 30°C. The OMEGA iTHX is simple to install and use, and features OMEGA's award-winning iServer technology that requires no special software except a web browser. The iTHX connects to an Ethernet network with a standard RJ45 connector and sends data in standard TCP/IP packets. It is easily configured with a simple menu using a web browser and can be password protected. From within an Ethernet LAN or over the Internet, the user simply types the IP address or an easy-toremember name such as "Cleanroom5" or "Server Room" in any web browser, and the iTHX serves a web page with the current readings. All OMEGA iTHX models that are on a LAN that is connected to the Internet can trigger an alarm that can be sent by email to a user or a distribution list anywhere in the world, including text messages to mobile phones and PDA's. The iTHX transmitters come complete with a temperature and humidity probe for measurement of a single location. OMEGA offers a choice of industrial probes in 50 mm (with a 90 cm cable) or 127 mm length (with a 3 m cable) instead of the commercial wand style probe which is designed for ambient indoor applications. It is not necessary to take the iTHX out of service for routine calibration. The temperature/ humidity sensors are interchangeable and can be replaced for about the same OMEGA offers replacement probes with optional 3-point traceable calibration certificates. The OMEGA iTHX is great for monitoring temperature and humidity in applications such as: clean rooms, computer rooms, HVAC systems, pharmaceutical and food processing and storage, hospitals, laboratories, semiconductor labs, electronic assembly, warehousing, museums, manufacturing, greenhouses and, farm animal shelters. 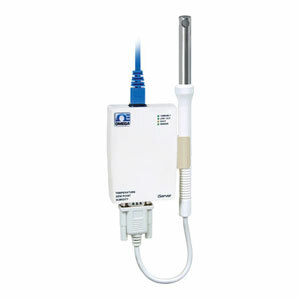 ** Note: Extended temperature range is for industrial probe only, refer to the iServer's operating temperature spec. Cable: 150 mm long with DB9 conn.